CANA is committed to gathering accurate and comprehensive cremation statistics to serve the needs of the death care industry and consumers. Our statistics on cremation are regarded as the most reliable and current available today. For twenty years, CANA has been collecting death and cremation data from state and provincial vital statistics departments or other designated regulatory agencies in the United States and Canada. From these figures, CANA has determined the annual percentage of cremations to deaths, which includes all the states and provinces. CANA has also been able to use these figures to forecast future cremation percentages. Click here for a printable PDF of the Infographic above. The annual growth rate is the difference between the yearly percentages of deaths cremated that are averaged over a five-year period. The table below shows the rates for the United States and Canada from 2002 through 2017. In 2017, the US cremation rate was 51.6%. By 2022, the US cremation rate is projected to reach 57.8%. Given the significant political and recessional changes, a regression analysis was implemented to aid the interpretation of the data. This regression analysis was applied over a ten-year period in states and provinces where such a data set was available. Complete industry statistical information is only accessible to current CANA members, but everyone can access an abbreviated report here. Please login to view this information or become a member today! If you are already a CANA member, access current reports here. Media inquiries should be directed to Barbara Kemmis, Executive Director, Barbara@cremationassociation.org or 312-245-1077. CANA’s second step was to look at the speed at which cremation rates grow. While it can take decades for the cremation rate to hit 5%—in the U.S. it took nearly 100 years—when it reaches 5%, the growth rate is more predictable and steady. There is no evidence that this trend will change or reverse, barring the introduction of a new form of disposition. We are currently in a period of rapid growth that will peak around 60% and then begin to slow until it reaches an eventual plateau. Why are people choosing cremation in the first place? CANA research models demographic traits that correlate strongly with cremation rates. More of the U.S. population has chosen to roam across the country and around the world. Many have loosened their connections to their geographic origins and increased their exposure to new traditions. Conversely, there are significant portions of the population who are rooted to their hometowns and remain deeply connected to the traditions they grew up with. 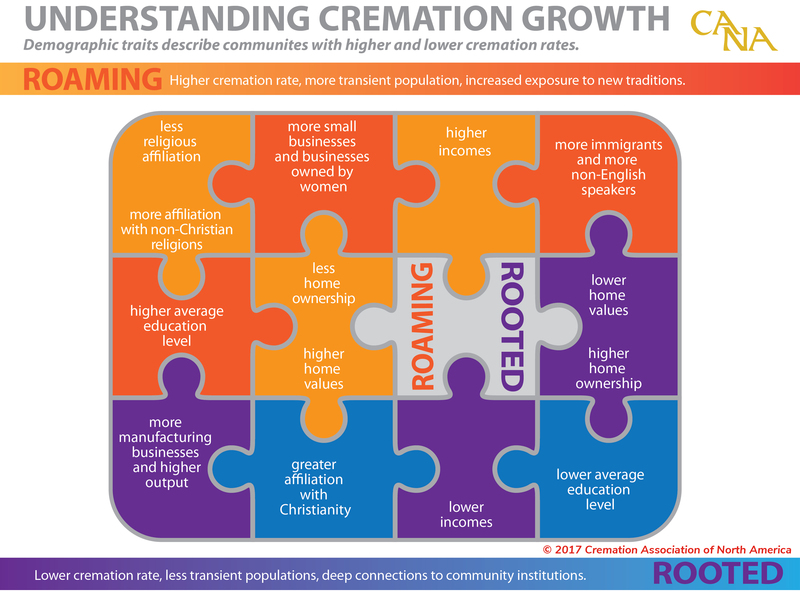 The graphic below tells an interesting story of demographic factors indicating a break from tradition in opposition to a more rooted environment, each piece just one part of the demographics correlating with higher or lower cremation rates. Complete industry statistical information is only accessible to current CANA members. Please login to view this information or become a member today!